Breakfast was never my favorite meal and it has become less so since we moved to the US. Sweet cereals, sweet breads, sweet pastries—everything is sweet. I'd rather have leftovers from dinner for breakfast. Or brunch. Breakfast in India spoiled me, especially when we traveled, as there was always an enormous spread: idlis, dosas, upma, and the desi omelet. There was a whole bunch of other stuff, too: Chinese pot stickers, cheeses, parfaits, and even cereal but none of us ventured close to those buffets. Why would we? The dosas were made to order as were the omelets! 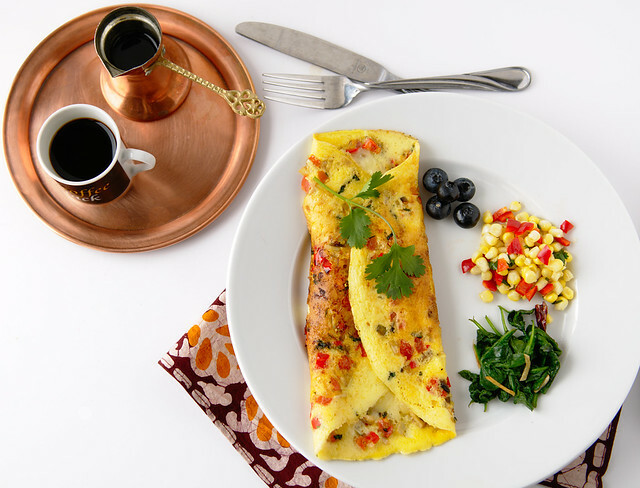 You could say that the desi omelet is like a frittata that has been folded over. 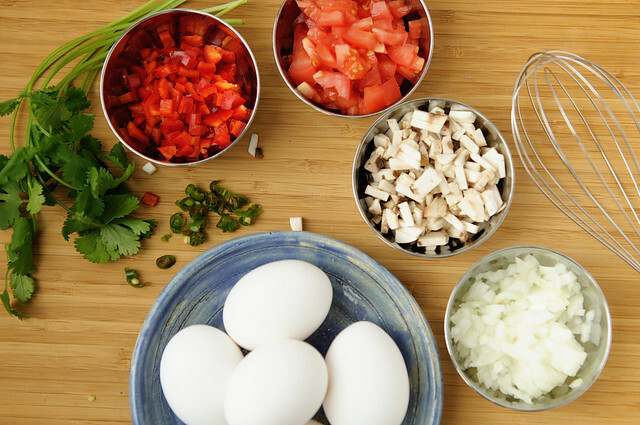 The chef usually has an array of finely diced veggies, meats and herbs you could add to your custom omelet: onions, tomatoes, mushrooms, bell peppers, green chiles, cilantro, bell peppers, ham, chicken, and cheese. It's very tempting to say I'll have everything! We usually made an early brunch of the breakfast spread and only then, ventured out to see palaces made from red sandstone. 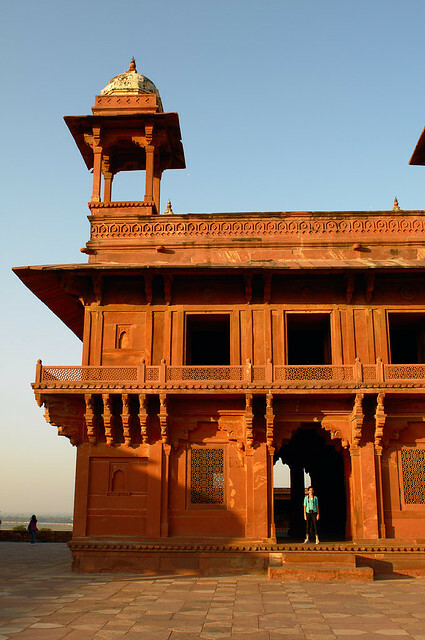 Fatehpur Sikri, seat of the Moghul Empire for about a decade, is made up of the monument of Salim Chisti's tomb and the little city of palaces and gardens, all within a fort. Salim Chisti's tomb is free to everyone whereas there is an entrance fee to the palaces, now a UNESCO World Heritage Site. We retrieved our shoes and wandered on to immerse ourselves, yet again, in the Moghul era. I was completely done with annoying guides and decided to rely on the erstwhile lost paper, written by Anita, for details of each building. Unfortunately for us, this part of our visit was rushed as we had spent too much time at the tomb, leaving us only an hour or so to absorb the sheer beauty of these buildings. My husband's anxiety levels started waxing as the sun dipped because it meant driving to Jaipur in the dark. It was also the day of the lunar eclipse and at the back of our minds was the superstition that one must avoid travel or proceed with caution. Our driver had already executed some crazy maneuvers en route to Fatehpur Sikri from Agra, making for some very tense moments. Maybe it was time to get superstitious! 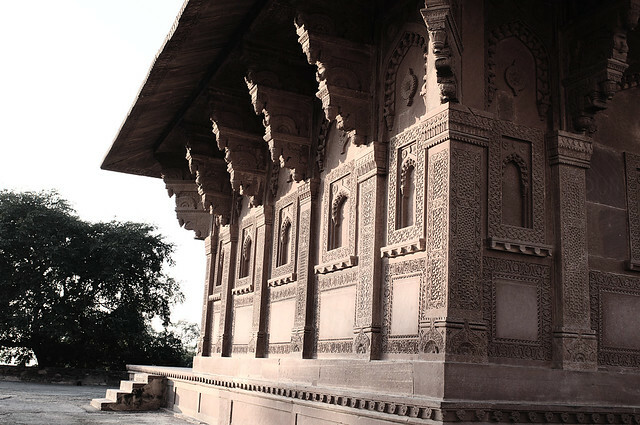 One of the most spectacular buildings is the Badgir or the Panch Mahal. 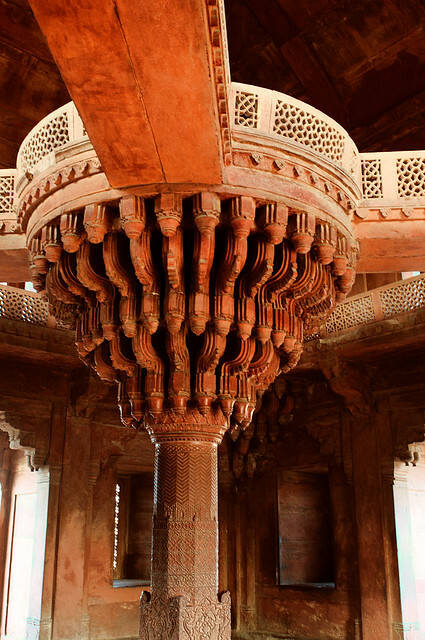 Five-storeyed, it gets smaller with each floor, with the chhatri on the top-most floor reserved for the Emperor. I wanted to go up there for views of the city outside the fort but the upper floors were closed to the public. I also wanted to look down at the Pachisi Court, a life-size checkered board game where people once served as the playing pieces. I walked in and out of these palaces, through corridors lined with ornate pillars, with a feeling of reverence. The palaces are in excellent condition and it's unfortunate—or is it—that this beautiful monument does not draw as many crowds as the Taj Mahal. Apart from a few other families, we had the palaces to ourselves. 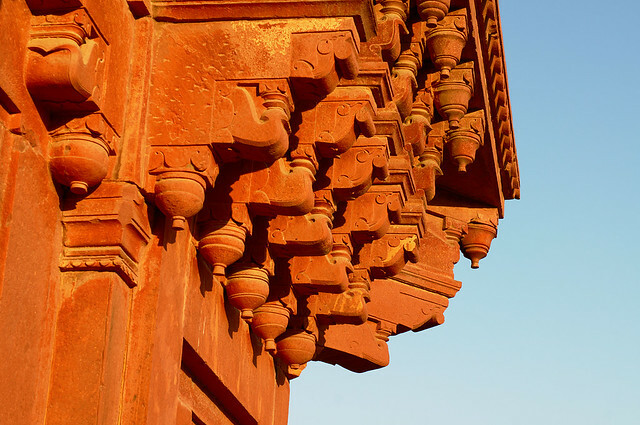 The light was beautiful and the red Sikri sandstone reflected the glow of the setting sun, adding another dimension to the feeling of awe. 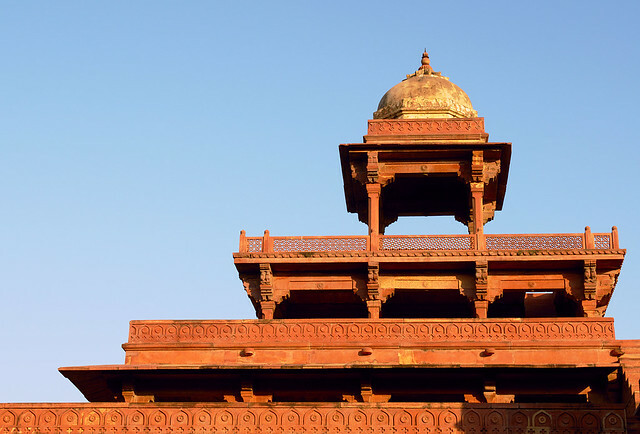 I made a vow to go back to Fatehpur Sikri and spend an entire day there, if not more. My bestie Anita has promised to go along. I'm sure I will get a photocopy this time, even if she's right there to watch over her research paper. Heat a medium skillet, preferably cast iron, and melt the butter in it. Do not skimp on the butter, using more if required. Keep a cover handy. Add onions, tomatoes, cilantro and green chiles. Stir fry for a couple of minutes on medium-high. Add mushrooms and bell peppers. Sprinkle salt and stir fry for another couple of minutes. While the veggies are frying, break eggs into a tall and narrow beaker or container. Add a splash of milk and note the volume of the mixture. Beat until the eggs are frothy and at least twice the volume that you started off with. Spread the veggies all over the skillet, distributing them as evenly as possible but leaving a margin of an inch or so from the edge of the skillet. Pour the beaten eggs over the veggies making sure you transfer all the froth to the skillet. Sprinkle salt and pepper all over. Cover and cook on medium for 2-3 minutes. The omelet will rise and become fluffy. Carefully tease the edges of the omelet away from the skillet. If the edges are not cooked, cover and cook for another minute. Put grated cheese along the middle of the omelet and cover for another minute so that the cheese melts. If the edges of the omelet appear to brown quickly, turn the heat down to medium or lower. Fold a third of the omelet over onto the cheese. It will melt further as you do this and then fold a third from the other side over as well. Serve hot with or without toast and with sides like wilted spinach, fresh corn salad, berries and fruit. This is an inexact recipe. Please use as much or as little of the ingredients as you wish. 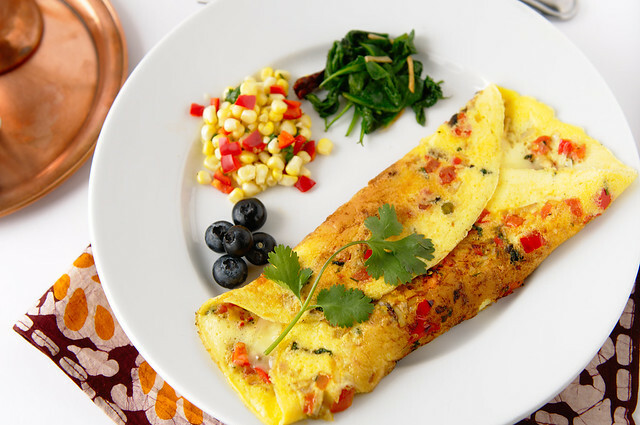 There are many versions of the Indian omelet and this is how we like it best. Diced ham or cooked chicken can be added to this omelet. Some people add cumin and ginger. Beating the eggs in a tall and narrow container makes for more froth. The frothier the egg mixture, the more the omelet will rise when covered. Try to maintain a balance between the veggies and the eggs. If you use too many veggies, the egg mixture will not be able to hold everything together and your omelet will break as you fold it over. I add extra eggs and split the omelet between two people. Try not to let the omelet brown too quickly as it will become crisp and again, the omelet will break and crack as you fold it over. I've made many cracked omelets in my lifetime. They don't look very good but they taste just fine! Use cheese that melts well. Tillamook's Pepper Jack Cheese is our favorite. Mozzarella cheese works well, too. I skip bread and opt for more egg or sides with my omelet. I like to top mine with a dash of Sriracha sauce. Others in my family prefer ketchup. I made the mistake of introducing Medha to desi omelet a couple of years ago. She loves it so much that eggs cooked any other way are eaten under duress. This is our go-to meal for brunch on Sundays and dinner on busy weekdays. I've been planning to post this recipe for several years now but the pictures were never right or I was too tired to take any. This post came together because of a conversation on Twitter when Jaya mentioned omelets. Jaya, Soma and I decided that omelets were on the menu for dinner that night. Soma bailed as she had only one egg which she needed for her daughter's lunch box the next day but promised to make it soon. Aqua Daze jumped into the fray and we agreed to use this collective energy to each write a Desi Omelet post by the end of May. I hope to update this post with links to their posts so that you can see their take on Indian Omelet. Loved seing your travel pics and reading about them. Your omlette recipe brought back fond memories of a get-to-gather with friends. This wonderful guy friend made the exact same omlettes. He also added a little bit of garlic paste to the egg mixture. They were an instant hit. Manisha, This is absolutely gorgeous post. Stunning photography of the places and the your desi omelette is absolutely mouth watering!! Love this post!! I could almost take a bite of the scrumptious omlette right out of the picture you posted. Looks Delish...I was quite taken by the copper coffee holder. Love the post and the pics. Have some experience of omelettes at brunches and I guess I have enjoyed them as much as you did. Though I make it a point to try out everything at a buffet!!! lovely read - enjoyed ur travelogue and the desi omlette simply put ROCKS ! Birbal has always been a favorite figure of mine growing up and now I have new respect for him. The house he designed is amazing and you have captured the buildings so beautifully. I think it is a good thing not a lot of people go there or there would be a ton of grafiti on those beautiful buildings by now. Agree with Soma Ms. Super Fast. It is good though cause now I have an idea how to style my omelet. Of course, my way of making it is just a bit different but that is the fun of desi omelete, hun? It's been a while I had an omelette..This Sunday that's what I am going to have for breakfast! Great pictures!!! Great blog!!! What brilliant pictures! I envy your trip. The omelette looks stunning, so vividly colorful. I haven't quite figured out the trick to getting non-soggy veggies in the omelette. I experienced these on a Caribbean cruise, the desi waiters would be making omelettes on demand and when an Indian guest stopped by they would mischievously (sp?) pop in a few chillies for good measure. Incredible pics and wonderful memories you are sharing with us from these places. I so want to go to India some time. I am with you I need to have some savory food for Breakie. A little bit salty a little bit sweet and a huge mug of black coffee! Omlette looks refreshing with veggies in it. I never cooked it covering with lid, should try it!! The pictures are fabulous.... after a long time I am back to blogging world, miss all my old frens including you. Catching up lately!! I make this quite often but not usually with mushrooms. sometimes, like today, I used some left over aloo curry and made a scrambled affair using the same ingredients. Never fails! Desi omlettes are also connected with the idea of a vacation in my head - from indian railways ones, to the kind served up in circuit houses, or cozy mid-range hotels and guest houses in the '80s and '90s. Those usually didn't have mushrooms or bell-peppers in them though - just onions, tomatoes, green chillies and cilantro all finely minced. And while I refined my omlette technique, learning from the husband, america's test kitchen and Julia child - for the flavors..I am with Medha - desi all the way - all else under 'duress'!! That omlette is making me hungry. I just had a salad for lunch (yes, I'm fighting that war again!) :) must.stick.to.diet. We love Indian breakfast too and I'm with you all the way on it beating the sweet kind, I was like that all my life growing up in Canada, as a child I put HP sauce on my toaster waffles, it must have been the tamarind I liked. I can't wait to hit the breakfast buffets on our next trip there in October. Idli is one of the best foods in the world. Enjoy it all! Swapna, so good to hear from you again! Your baby will be 2 soon? Happy birthday to her! I haven't tried omelet with garlic! Thanks for that idea! Soma, it tied in so well with my post that I couldn't resist. Besides, I've been so busy that this was an ideal meal! Looking forward to your post! Shulie, thanks! I hope you make your desi omelet soon and write about it, too! Ameeta, it's good! Even better than the greasy CR 'aamlet-cutless' on the Deccan Queen or Sinhagad Express. The copper coffee cup is a garage sale find! Indu, there was no way we could have tried everything at the buffets. The spread was that huge. It was a no-brainer though for us to pick what we did as we don't get any of that stuff here. I have to make it! Priya, thanks! That is sweet of you! Desisoccermom, it is in such great shape, really! I was looking at pics of Konark on a Flickr friend's page and both, the upkeep and restoration, are very poor. It's heart-breaking. :-( Looking forward to reading about your omelet! Mrinalini, yay! That makes me happy! Ann, thanks! I sauté the veggies on medium-high in more butter than I would normally use. I think this helps to a certain extent. They should look like this before you add the eggs. Your caribbean cruise sounds like fun! Adam & Theresa, I like you already! 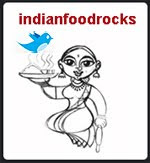 Idli is indeed one of the best foods in the world! It's our favorite! It sounds like you were looking for spicy and tangy flavors from your youth! I hope you have a good visit in October. Where will your trip take you? simply love the photographs, especially the first one. Hv never travelled too much in India (and want to do it once the daughter is older) and I am enjoying this virtual tour on your blog. Omelet is such a versatile meal and love the way you make it. Incidentally, it is the only (decent) thing my husband can make! Which is why we were very disappointed when we first travelled abroad and exPerienced our first hotel breakfast buffet - not even eggs to order which even a 2 star here offers ! I can't stand sweet stuff in the morning either so that pretty much shrinks my choice to almost nothing. Hey I left a really long comment on this post, and it saved, and it was there for a day, and now its gone! !Wonder what happened?!! Folks, Blogger had some serious issues on May 11-13 due to some new code they released. They rolled back to May 11, leading to lost posts and comments. They have since restored lost posts and are working on restoring lost comments. Until then, I am pasting previously posted comments from the email notifications I get. Once the comments are restored, I will delete this post. I hope I haven't missed any. If I have, let me know! Well, lookit! The comments that disappeared are back! Heguiberto, I hope you get to visit India soon! I know I want to go again, too! Padma, welcome back! It will be good to have you around again! smdatta, looking forward to your version! Marlis, I first had it with mushrooms in Goa and since then, I like to add them if I have them on hand. Like I did this time. You can add any veggies you like. Aloo sabzi with eggs sounds delicious - all my fave foods! Sacredfig, pehla aamlet to deep-fried che! I will ping you for his coordinates the next time I am in Baroda. Mushrooms and bell peppers are ingredients from the modern kitchen. Like you said, aamlet-cutless is reminiscent of train rides mostly. GB, by the time we were in the palaces of Fatehpur Sikri, there were very few people around. This was close to sunset so it was easy to take pictures without the few that were around. Pel, sorry and thanks! Blogger had many glitches that week! Eggs are good for you! I'd rather eat an egg than a slice of bread, more nutritious and keeps me going longer. aqua, I'm having a good time reliving it all, too! This way the memories won't be as hazy for me as time passes by! When are you posting yours? Miri, you will rarely find a good breakfast at the hotels / motels here. For that, you have to go to a good diner or a known Mom & Pop breakfast place. I looked up your omelet recipe and it's yum! I will update my post with a link to it, soon. Like I was telling Shulie I wish I was in this with you guys. I love me an Indian omelet. Coming to your blog is always so nostalgic for me, takes me back to India with every post. Wow the detail on those buildings...just stunning. And your omelette looks absolutely delish. Didn't realize there was an Indian way of making them. Your photos telling how much fair of this palace. Thanks for posting this.